Choosing the right gear for hunting is an easy task. Where you hunt and the way you hunt will dictate what gear you’ll take hunting and deer hunting. Obviously if you’re hunting 100 yards from your vehicle, you’re not going to need a backpack, tent and camping equipment or other gear that someone hunting miles from the nearest road will need! For the sake of this article, I’m assuming that you’re hunting public land from your vehicle or from a base camp. Multi-Tool W/Leather Sheath is a must have no matter where you hunt. You can never tell where you’ll need a set of pliers or a Phillips screwdriver…or even a bottle opener! This tool will pay for itself many times over. I wear one on my belt every day and I’m still amazed at how many uses these tools have and how often I seem to need them! The knife blade is even adequate for field dressing a deer. A Compass is also a necessity, even if I’m hunting near the vehicle. Should you have to trail an animal, you never know where or how far it may run. Finding you way out after dark can get a little tricky if you don’t know which way you’re heading. A GPS unit is also handy if you want to pay the money for one. Unlike the Compass, you do have to remember to check the batteries and carry extra’s. A Quality Hunting knife is a must have. Sure, the blade on a Leatherman will work, but it’s not as good as a sturdy 3 to 4 inch blade. That’s all you need to field dress any Deer. You can always spot the Newbies in the field, they’re carry Rambo type knives! Folding saws are also very handy. You’ll find them a necessity for not only cutting shooting lanes in the early season, but they can be used for a variety of other uses such as cutting the pelvic bone on a Big Game animal or other bones. Parachute cord and a short length of rope. When a daypack goes kaput or you have a “wardrobe malfunction” in the woods, nothing is more handy than a section of parachute cord. You can tie Deer’s feet together and a myriad of other uses. A stout length of short rope should be brought along to drag the animal out. I prefer the harness type systems now on the market but I have put a rope around a buck’s neck and the other end around a short length of sapling and pulled many bucks out of the woods. A first aid kit is also a must. You can find many small pocket sized first aid kits in most of the Outdoor Catalogs such as Bass Pro. You never know when you’ll need it and it can be the difference that keeps a minor injury from becoming a life threatening one. They’re a small price to pay for the value they add. Flashlights are also another must have. I generally carry two of the mini-maglites with spare batteries. They put off a great amount of light for their size. They can be your best friend when it’s dark and you’re miles away from your camp or vehicle. Waterproof matches and a Bic lighter. Yeah, I carry both! I carry the waterproof matches in a waterproof match container. A Deer hunter can’t be too careful! I also carry a couple 35 mm canisters with cotton balls soaked in lighter fluid or commercial type firestarters. It can be tough to get a fire going when everything’s wet! A short length of duct tape wrapped around a pencil. I’m killing two birds with one stone here! If I’m hunting in a state that requires you to sign your tag with a pen, then I wrap the duct tape around the pen. I also carry a pocket size notepad. Water and a few snacks round out the gear I take on short day hunting trips. This may sound like a lot of stuff to carry around. It really isn’t. 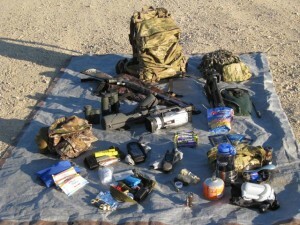 I keep most of this gear in a zip lock bag wrapped up either in my fanny pack or one of the pockets on my pants. Choosing the right gear for Deer hunting can make or break any Deer hunt. Be prepared for the unexpected with your own deer hunting gear kit! Click here to find more of the Best Hunting gear to add to your Hunting Gear List!